Notorious for biting and buzzing at outdoor events, mosquitoes are found worldwide. 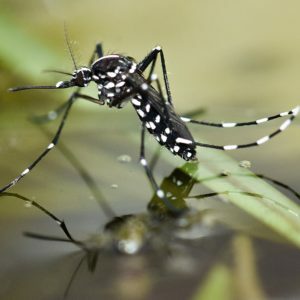 Mosquitoes breed and lay their eggs in just about any source of standing water, including small sources of standing water such as water found in a tire track after rain. Some species will even lay eggs in dry places that will become flooded eventually. However, they won’t lay eggs in moving water such as flowing rivers, streams, lakes and large, open bodies of water. Depending on the species and climate, breeding may occur just once a year or continuously. Flight range, which varies by species, temperature, wind direction, time of year and distance to blood meal sources, can be 18 miles (29 kilometers) to 110 miles (177 kilometers), but averages 5-10 miles (8-16 kilometers). Biting times also vary by species with some biting only at dawn and dusk, some only during the day, and others at dawn, dusk and during the night. Mosquitoes are a major public health threat because they can serve as vectors of numerous human diseases such as West Nile virus, Zika virus, chikungunya, dengue fever, encephalitis, malaria, yellow fever, filariasis and more, especially in tropical areas or wild areas without a good area-wide mosquito management program. Gray to black, some marked with white, silver, green or iridescent blue scales. 1/8-3/8 of an inch (3-9 millimeters) long. Adults measure 1/8-3/8 of an inch (3-9 millimeters) long; gray to black, some marked with white, silver, green or iridescent blue scales covering body and legs. The larvae of most species feed on small aquatic organisms and organic debris which they strain out of the water with a series of oral brushes. Although quite active, the pupae do not feed. Adult males feed on flower nectar. Adult females also feed on nectar, but require a blood meal before and after laying eggs. Individually on water with floats; hatching within a few days. In rafts on water with up to 100+ eggs per raft; hatching within a few days. Individually in a semi-dry place, such as moist soil near water; sometimes lying dormant for 3-5 years until water overtakes the immediate area (e.g. floodwater mosquitoes). Developmental time (egg to adult) is about 10-14 days. Adult females may live 1-2 months (males about 6-7 days) in the summer or for 6 or more months if they overwinter. Mosquitoes can fly considerable distances and control measures on a single property have little chance of success. Likewise, area-wide mosquito management programs only have limited success if a few properties are excluded from treatment or if programs are slow in reacting to heavy rains.